Download The Karate Kid in Digital HD from the iTunes store. The Karate Kid images are © Columbia Pictures. All Rights Reserved. 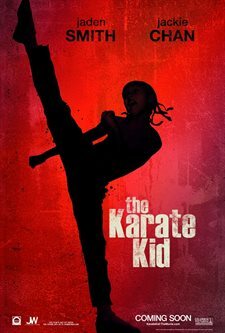 The Karate Kid of 1984, featuring Pat Morita and Ralph Macchio, on which this remake is based, is a classic coming of age story, despite the principals' lack of familiarity with any of the vagaries of the martial arts they pretended to practice. When I heard they were remaking it, I couldn't imagine why, but for the usual cynical reasons. Learning more about the movie in the run-up to the release did not arouse any semblance of sense. Firstly, the movie would feature Kung Fu and take place in China, yet retain the Karate Kid title. Secondly, it was designed as a "star vehicle" to launch the acting career of Jaden Smith, son of mega-star Will Smith. Indeed, he gets credit before the venerable Jackie Chan — something that did not sit right with me. I realized that the thematic outline of the movie would still work, and I figured that Mr. Han (Chan) might not live up to Mr. Miyagi (Morita), but one could hardly expect that. Having seen it, I'm pleased to report that it was surprisingly good. The film hews to the original closely enough to be sufficiently recognizable, but diverges where it might in order to color the character of the film, both visually by way of the vast natural beauty of China, and kinetically by way of Kung Fu. The bad guys speak very little English, communicating to the audience instead via subtitles, a moderately gutsy decision. The film gives Jackie Chan more meat to chew on with a brief look into his tragic back-story, taking him out of his comic comfort zone. The movie is long, yet moves reasonably quickly; perhaps it moves too quickly in the sense of plot timeline, considering that Dre Parker (Smith) learns skills it takes a lifetime to master in the course of a few weeks). The supporting cast is good, with Dre's girlfriend Meiying (Wenwen Han) stealing a scene here and there. Smith is also credible, to my great pleasure. For a young actor, especially one with his pedigree, playing a character that is cocky, yet vulnerable, is probably one of the greatest challenges to face. I have never felt, for example, anything resembling charisma from Transformers star Shia LaBeouf, but I wound up liking Smith. The Kung Fu training, a departure from the Karate of the original film, pays homage to both the demands of the outrageous Kung Fu of cinema legend and limitations of skilled practice in the real world such as you might believe. The bullies are definitely a step down from the scary skeleton-pajama clad California toughs of the original. These 12-year-old Kung Fu gangsters are mean, but you never get the impression the stern school principal couldn't slap them straight if they ever misbehaved in front of her. The evil master is good for his part, but we never get anything as resonant as the original's Cobra Kai. It is perhaps a failure of the daring reliance on subtitles that we don't get the cultural cues from these antagonists that we got from a suburban bad-guy karate school in sunny California. Many will complain that this Karate Kid does not quite do the service for Kung Fu that the original did for Karate. For my part, I think that the "realism" of the movie, with respect to the martial arts, is quite inferior to the merit of the story it's telling. I did slightly cringe in disbelief when Dre, after several practice-by-yourself sessions of the wax-on/wax-off variety, pulled off a body spinning sacrifice throw. To be fair, I believe that the story would not have been at all improved with a "10-years-later" segue to make time for learning that. It also wouldn't have been improved with head-gear and gloves. The creators have taken an original, winning formula and poured more iron into it to recast a recognizable original for a new generation. The changes they made were thoughtful. Even their decision to keep the absurd name makes sense when you realize that every 40 year old parent will take their kids because they recognize it, never mind any quibbles over the specific martial arts in play. I would.